Mackie is on a roll. The company has announced a series of new products at NAMM 2018, including two new HM headphone amplifiers — the Mackie HM4, HM-400 and the Mackie HM-800. The new devices are built with a top-tier construction quality, but more importantly they’re built to bring a range of new tools to small and medium studios. The HM-4 is built as the ultra-compact model in the series, and it, like the name suggests, offers a total of four headphone outputs with a simple volume knob for playback control. Unlike the other two devices, the HM-4 is not rack-mountable, but instead aimed at being portable and quick. 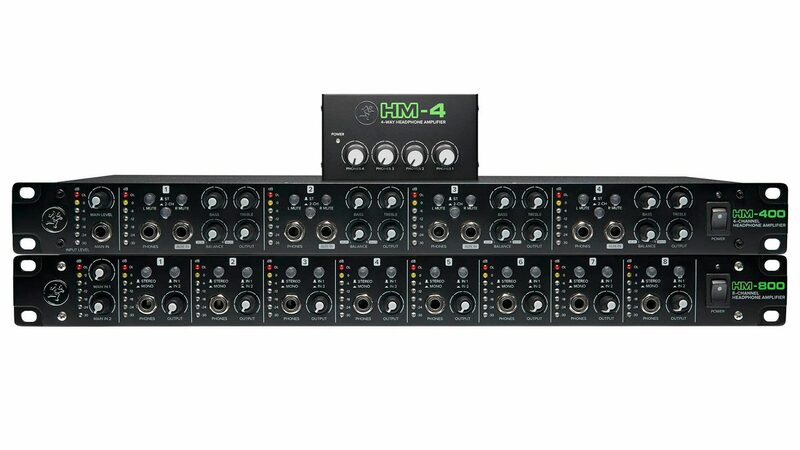 The Mackie HM-400, on the other hand, is rack-mountable, and like the HM-4 it offers a total of four headphone outputs. It goes the extra mile, however, with its main output controls, three-band EQ, an aux in for each output, and the ability to mute left or right channels. That makes it a whole lot more versatile than the HM-4. Last but not least is the HM-800, which basically takes the versatility of the HM-400, but does away with the EQ (which you may not use much for headphones anyway), and offers eight outputs instead of four. The move does make sense for Mackie — and it’s perhaps about time that this line is on offer. Other companies have certainly offered a lot in the headphone amplifier space, but Mackie has been making some serious headlines in the past year or two for offering high-quality, inexpensive products for home, small, and medium studios. We know this first hand — the Mackie Onyx Producer 2•2, Mackie Big Knob Studio, and Mackie Big Knob Passive all scored excellently in our review — and for good reason. We expect that trend to continue in 2018, especially given Mackie’s announcements so early in the year. The Mackie HM-4 comes in at $42, the HM-400 at $210, and the HM-800 at $280. They’ll be available on February 1st from the Mackie website, and we assume from Mackie’s Amazon store too.